My students have just completed their second session of Genius Hour. After our first one this past December I was anticipating even better projects and deeper learning. I started them thinking months ago about what they wonder about. I set up a Wonder Wall. 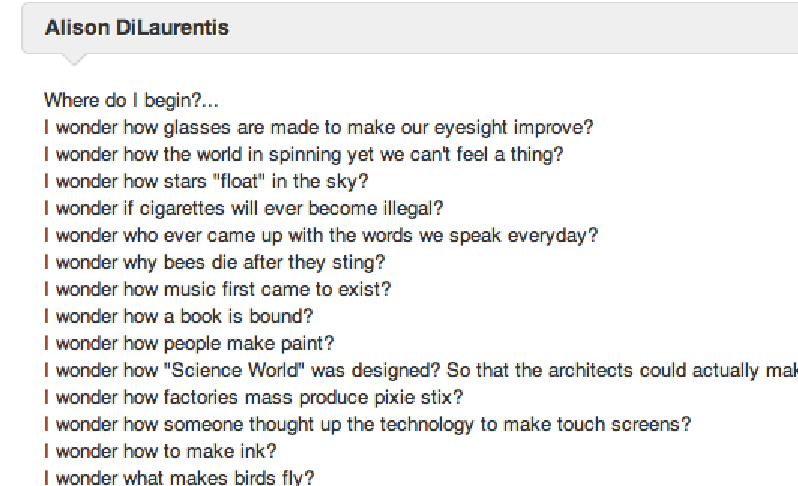 we talked, we shared, and I found posts of other students’ projects to inspire the wonderings of my students. But I was met with many blank stares – who knew that finding something they wondered about that is driven by a great question could be so difficult! Too often it was about the doing – “I want to make a pyramid using Mind Craft”, “I want to build an arrow.”, “I want to do jumpshot tricks.” What was lacking was the inquisitive learning. We reviewed great questions, questions that prompted thinking, questions that led to more questions. 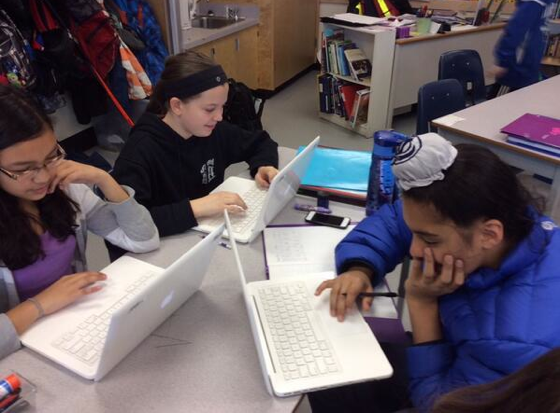 Finally, after asking students to share their wonderings one night on the class website, the ideas began to flow. One students listed about 20 wonderings which spurred others in their thinking and the wonderings started to build and unfold. 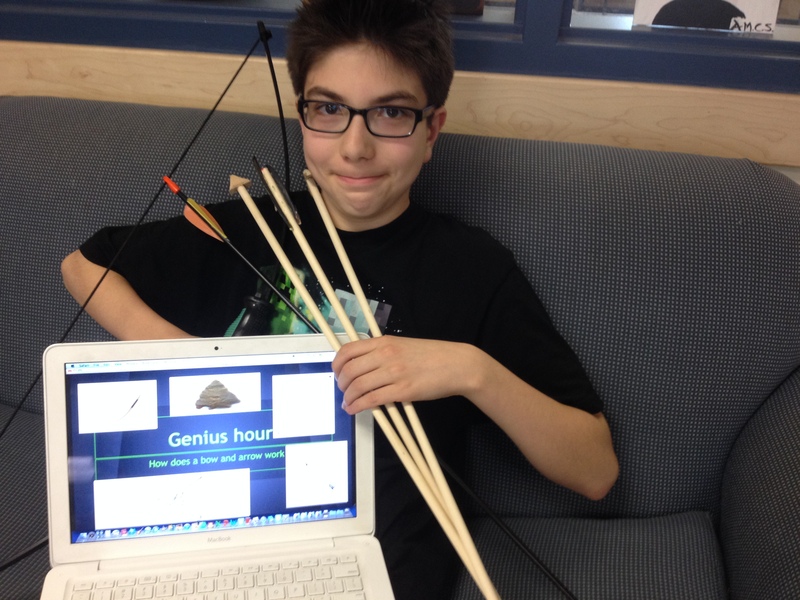 Having a slow start became, really, a foreshadowing of how the rest of this second Genius Hour went for me. I know, I know, it is not about me, it is about the students, but as educators we hope to build new skills in the learning of our students, we hope to push their thinking to new levels whenever we can and wherever we are. Over 4 Genius Hour sessions students were engaged in their learning; I cannot deny that classroom management issues during these sessions was basically non existent. Some students chose to go it alone while others chose to work with partners that had similar wonderings. There was even one group of three as they discovered their paths were completely aligned and collaboration would benefit each. The questions that were asked ranged from what was the evolution and creation of guitars, how gun powder fires a bullet, and how to create anime using the deviantart website long with many more. (For a complete list of this term’s GH questions visit my class website GH page.) Really, most of the projects had students digging deeper and learning new things. But did it inspire their passions – I don’t feel it did and maybe this is where I am struggling. I have taken the time to really think about what I want from Genius Hour or better yet, what I am hoping for the learning of the students. It is important that students have time to choose their own line of learning but should it not develop their thinking more deeply? I want to help them develop their critical thinking skills so does this mean I need to be more directive with the types of questions they have? But then does this take away from the autonomy of their choices? Does this go back to the control of the teacher? Have other teachers also faced this dilemma when starting out with passion based projects? Another aspect of this session that really, really bothered me (again I know it is not about me) was that I felt the students had their heads staring at lap top and iPad screens far too much. As my classroom has access to technology on a daily basis and we are a BYOD school (at least in grade 6/7) I am feeling more and more the pull to have students spend some time away from the screens and more on the creative hands-on approach. Research definitely needs to occur, but does this require accessing the computers? Could research mean getting in touch with an expert in their field? The one group of three were looking at why dogs are color blind. I happen to know a dog expert and helped the students set up an interview with her. They were thrilled with this face to face experience and gained so much more than reading the information on-line. I was hoping more students would go in this direction and ask for help with connecting with experts. So I wonder if this should be one of the requirements of their projects – connect with an expert. I also feel that not enough students are choosing to create or make something. What I mean is that if you want to know how the insides of an Xbox work than taking one apart and discovering connections, wiring, set up are all part of the process. Yes, you can look it up on You tube but isn’t discovery one of the most meaningful ways of learning? There were a variety of students who did create items but did so at home. Arrows were made side by side with a dad, truffle chocolates were made but done at home, not at school. It almost felt like Science Fair rather than Genius Hour. How can I go about adjusting this so more of the discovery happens without parent help/control? Does this matter as they still are working on what they wish to do and are spending quality time with parents? How can I, and should I, expect students to do more of the work at school so that they are not just using their time with me on the lap tops? There are just so many questions I have before I start the next Genius Hour session. I would love input from those of you who have spent time implementing and developing the learning within Genius Hour in your classrooms. How much do you establish around guidelines of GH projects? Do you ask for a ‘make it’ component and does it need to be done at school? Where have you found inspiration to help students think about their deeper wonderings? These are just the tip of the iceberg for me. Hearing your stories and ideas may help me find solid ground with which to stand before beginning the third Genius Hour session in my class. 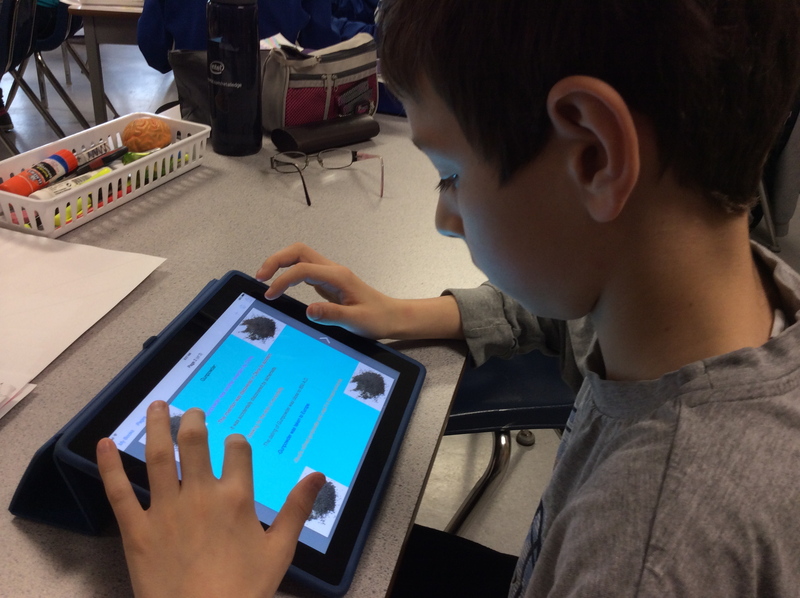 This entry was posted in 21st Century Learning, Genius Hour and tagged passion based learning, student choice, student engagement, students by Anne-Marie Middleton. Bookmark the permalink. This is a very thoughtful post and you raise many good questions. It really helps to know that others are doing this and reflecting, Thanks! It looks like we teach the same age group, my partner teacher and I are attempting to do this with one 6th and one 5/6 split. We started this fall with what we called “passion time.” It sounds like you had more tech resources, currently we have 10 laptops that we share and 6 desktops. We do have access to our school computer lab once a week. Because we had to share computers, some of the research was done at home. We have passion time about three 45 minute sessions a week (this varies). We started out with the kids brainstorming their own interests. When they had a topic, they then came up with some essential questions. Yes, some of the projects did have a “show and tell” feel, but we felt it really was a great way for us to get to know our kids and their outside interests. The 2nd round they were told to pick an issue or topic they cared about that would help others. For example, two girls collected donations of pet supplies to benefit a local animal shelter. Another, who has diabetes prepared a presentation to show others what living with this disease is like. This is where we really saw some amazing projects and learning. Most of the kids are on project 3 now, which we left wide open. Some are still working alone, some with one or two others. Where we have seen the most growth has been in the presentation skills. They have really learned from each other, seeing the difference between great presentations and just so-so ones. And trust me, there have been so-so ones!! I hope you stick with it, I really think it helps to look at it as a work in progress. We have been trying to see how we can improve this for next year, but we think we will do this again, for sure! The student and teacher engagement is worth it! Thanks again and good luck with the next session of GH projects. I was faced with a lot of these same questions as I have been doing genius hour now for 2 years. It still does not look exactly how I want it to look and definitely some of my students really are not going as deep as I want them to go with their learning. I almost quit it actually because I had so many surface type projects and I was getting frustrated. A few students would get more interested in others’ projects and want to “help” them, than their own, which showed me they just were not passionate about their own projects. Instead of quitting it, as a class we discussed it and reevaluated genius hour. We looked at examples of students projects in other classes, discussed the reflection process and the learning. I also started making them fill out a more detailed proposal sheet that looked at the what do you know already, what do you want to learn, how will you learn it questions. On this, I would pose deeper questions and meet with students to discuss where they were going with their learning. This has helped immensely. It’s still not quite where I want it, but I am getting higher quality projects. I also started to reflect on what I want my students to ultimately get out of genius hour. This is an idea of what they are interested in and passionate about, an opportunity to learn something THEY want to learn for once (I think this is why the blank faces, students don’t even know when faced with “You can do anything you want”. It is outside the realm of their understanding. So at first they draw from what they have seen from examples or what friends have done, and I think it takes some time before they get brave enough to try their own ideas.). I also want students to learn to problem solve when something goes wrong and not just give up! This has been a huge struggle for my students, when things seem “hard” their first instinct is to give up. (I wonder if this means they are not really passionate about their project). Some of them are finally getting into the swing of things. I can tell because I am getting blog comments about how they cannot wait to show me what they are doing. I think this pride and excitement about their work is amazing. Also, I love seeing them able to stand up in front of their peers and speak with confidence and answer questions about their projects rather than read from cue cards. To me, this is what shows evidence of real learning. As for them getting family involved and working on their projects at home. This excites me because it means they turned off their x-boxes and play stations to actually continue learning. I like that parents get to see them discovering first hand. Does this mean I want them to do it all at home? No. They know the expectations of our hour at school. What helped for me is I have students not on a timeline. So when they finish, they make a new proposal and then start again. The learning continues. Some projects take a month, some one session, some students work at home and at school, while some just work at school. When we reflect on our week, so many of them say they love to work on their choice of projects and they love they are allowed to be messy. I find meeting each child and asking questions and challenging them to go deeper really helps them. I think some of them are so used to that surface type thinking, that they didn’t even know what I meant. Hope this helps. I would suggest really thinking about what you want from this and thinking about how you can get that met so that you feel more comfortable with the learning that I’m sure IS happening. I know that I am finally getting students who are more engaged in their own learning. I also feel like I have less students giving up because “it’s hard”. Some of my favourites have been a book using the Book Creator app on our class’ genius hour projects, students have made all kinds of food (cookies, cake, pizza with homemade dough), models of CN tower/ Big Ben, a book on Greek gods due to their love of Percy Jackson books, a video of hair styles, a jive dance, and 2 students are looking at the history of Gastown (after a field trip walk) and one of them is trying to recreate the inside of the clock. Also i had students learn how to fight without touching and made a video. Do I still have students who haven’t found their passions yet? Yeah, probably 2. But I think they are getting closer. Thank you so much for taking the time to respond to my post in such a thoughtful and helpful(!) reply. You are spot on when you mention that I need to reflect more closely on what I want the students to get out of Genius Hour. Once I am explicitly clear, they will be too. Due to it being only our second round I am still very much in the learning curve. What I thought and hoped for when first embarking on this journey has shifted, as it should as we push through together. The student reflections are very important for me. I have been getting the students to reflect after each session but this often seems too rushed. Some students will write with unbelievable thought while others are superficial. I hope that all students will be engaged so much in their learning that their reflections will all be evidence of this. I do feel I need to take more time at the beginning with their proposals,as you stated, giving them better feedback before they start. Honestly, I think you are doing everything right. It’s really hard to kind of give up control. Or I find it hard!! My genius hour is leagues different from when I started and this class is so different than last year’s. Also, other teachers at my school do it completely different. Do what works for you. My students’ reflections are not near where their learning is. They are a source of frustration for me actually. I’m trying to model what I want cuz they are not giving it to me. LOL. I want their reflections to incorporate what they have learned through discussions with classmates and me, how their project changed from start to finish. Often the final product is VERY different from what they proposed due to shifts in their learning. I agree with Julie, where I see theost growth is in their oral speaking skills. I don’t have anyone who is nervous about presenting. They cannot wait!! That in itself is exciting! Your enthusiasm for Genius Hour is engaging. I will continue on, try new ideas, and ask the students what they would like out of it all. Thanks.